Heat oven to 375°F. Generously brush each side of tortillas with oil. Place tortillas on cookie sheets. Bake 8 to 10 minutes, turning after about 4 minutes, until edges are golden brown and crisp. Set aside. Meanwhile, in medium bowl, mix avocado, jicama, banana, orange, pineapple, onion, shrimp, cheese and mint. In small bowl, beat marmalade, sour cream, lime juice and chile with wire whisk until well blended. Reserve 2 tablespoons marmalade dressing. Gently toss remaining dressing with fruit mixture until evenly coated. Place 1 tortilla on each of 4 serving plates. Spoon heaping 1 cup fruit mixture onto each tortilla; top each with another tortilla. 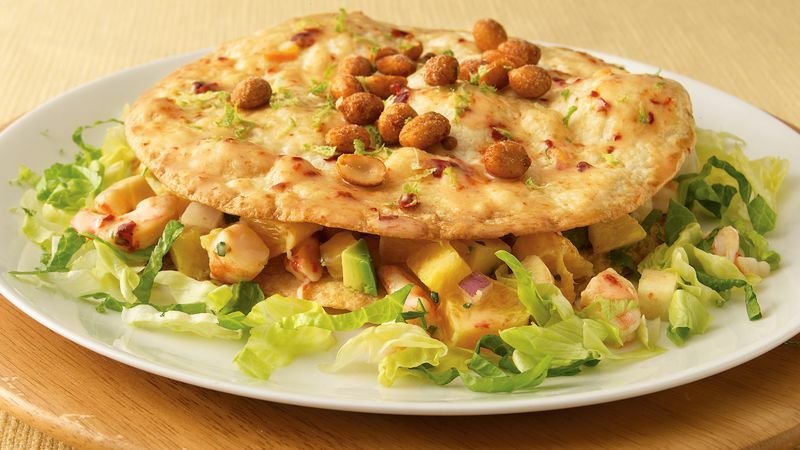 Brush reserved dressing over top of each tortilla stack; sprinkle with peanuts. Arrange shredded lettuce around each tortilla stack; garnish with lime peel.